Holland’s many international students come from 190 different countries. 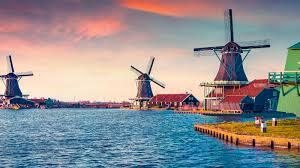 Dutch society is strongly connected to other cultures, the business community and the world. The Dutch are open-minded and direct, so it is easy to meet them and exchange ideas. The Dutch government wants to attract knowledge and retain talent. International graduates can therefore apply for a residence permit of one year to find a job, or start a business within three years of graduation. For more info on this orientation year as well as tips on how to find a job go to the career in Holland website and join our Holland Alumni network to increase your chances on the job market.